← Barn Charm – Add-On…? Several years ago, I’m thinking it was 2003, a good friend of ours won the Nascar Short Track regional championship. The awards banquet was held at The Opryland Hotel in Nashville. Motor Man and I were invited and attended. We stayed across the street at… The Radisson (I think). Anyway…unbeknownst to me, until we arrived, the Heart of Country Antique Show was taking place in Nashville THAT VERY WEEKEND. What are the odds?? I’ve never seen so many antiques in one place. The prices were a little steeper than I prefer, but I did find one item that I really liked, and it didn’t seem overpriced. The seller referred to it as a Chimney Cupboard. There was just one problem. Motor Man and I were driving a Chrysler Sebring Convertible, and there was NO way this cupboard was going to fit in that car. But Motor Man, as usual, had a plan. He found a list of the vendors for the show, and saw one from Raleigh. We had an upcoming trip planned to a race in South Carolina and would be driving through Raleigh. He asked that vendor if he would (with compensation, of course) take the cupboard home with him, and we’d pick it up en route to the race. We had a motor home at the time, so we knew we’d have room for it. The vendor agreed. Sometimes getting the treasure home is more difficult than finding it. This entry was posted in Traveling Days and tagged chimney cupboard, heart of country antique show, nascar short track, nashville, raleigh. Bookmark the permalink. 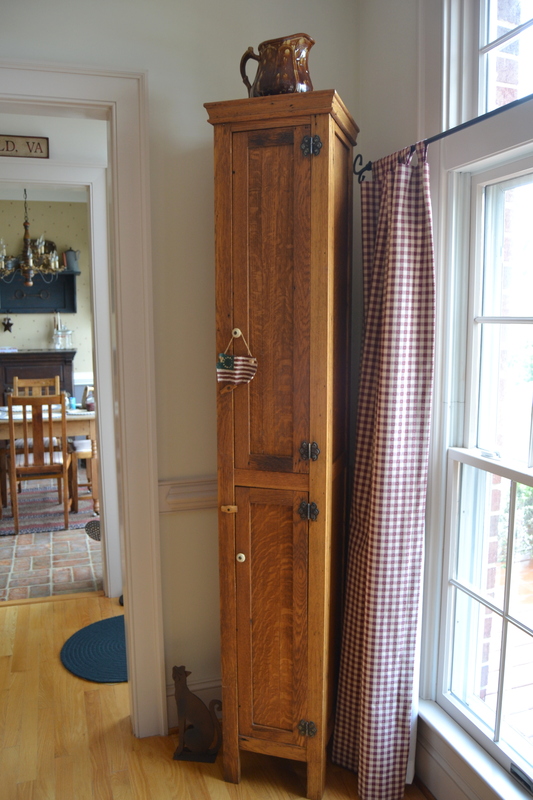 I just love that corner chimney cabinet – it’s in the perfect spot in your house and comes complete with a FUN memory about its’ acquisition – how cool is that?? That is interesting but not as interesting as gettiing the buffet home….that is what it’s called, isn’t it!!? JR is a one-of-a-kind husband that makes sure you get what you want!! Good thinking MM and that cabinet was meant for that corner. I remember the weekend. Such a fun time and getting it all arranged was half the fun. And it is perfect for that corner. You know me!! That’s the first time I’ve noticed this. Really cute. I do like the one between the L/R and kitchen area. See, I do notice some things, That was an interesting time. What a great piece! Both the cabinet and the post full of the memories you have of transporting it to your home. Motor Man is awesome! He fixes everything! smart thinking, motor man! and great find, too! You were lucky to have the opportunity to get this unusual and very attractive cupboard. Hubby did a good job of getting it home too. Worth the extra effort to get it home—very nice! I’ve never noticed this in your home. I love it! What a great story and treasure! Lovely!! A very cool piece …. where there’s a will, there’s a way – & there’s definitely a will on that end !!! Giggling at Marshall’s comment. That Motor Man thinks of everything! That is one interesting and cute piece of furniture. Glad it found its way to your home. Your Motor Man is a good problem solver!